For many of us, the first image that comes to mind when we think about fiberglass insulation is a pink-colored batt that’s just wide enough to fit between studs or floor joists. But fiberglass insulation comes in other forms as well. Loose-fill fiberglass in manufactured in bales that are designed to be shredded into fluffy insulation that’s blown through a flexible hose into an attic or other space. Fiberglass insulation also comes in blanket form. Fiberglass blanket insulation is available in different widths and thicknesses, just like fiberglass batts. Wider widths are typically used in most applications. Also, fiberglass blanket insulation usually comes faced on one or both sides with plastic or foil. 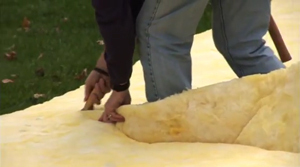 Fiberglass blanket insulation is often used to insulate tank-type water heaters. Light in weight and easy to handle and cut, the fiberglass blanket simply wraps around the outside of the tank, held in place by tape. The stone foundation walls found on some old houses present another opportunity to insulate with fiberglass blankets. The irregular surface of the stone wall makes it impossible to install rigid foam insulation, which is the favored insulation treatment for flat foundation walls. Fiberglass blanket insulation can drape easily over the irregular surface of a stone foundation wall. It just needs to be cut to the proper height and secured in place at the top and bottom of the wall.